When your desk space is inspiring, clean, and organized it makes for a much more productive day. 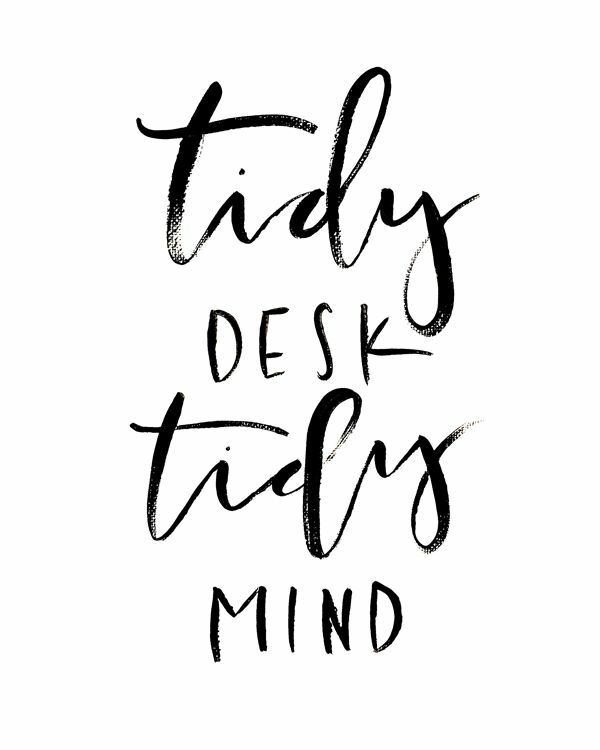 Take 10 minutes to organize your desk this morning whether you work from home or in an office. Anything that has not been utilized in the past month remove and place in storage. Open space is key. In terms of decoration or inspiration, change it on a quarterly or monthly basis. You'll know when you've seen the images around you enough or you're feeling stressed and bored. Make the space around you inspiring and beautiful. It will improve your work and help you to have a clear mind. As I mentioned earlier, clarity of space and minimal clutter in your work area is super important to your focus. Anything “extra” in your line of sight, subliminally, distracts the mind. So I like to also keep the containers that hold my work accessories as clean-lined and unobtrusive as possible. I tend to like clear glass or minimal and modern looking pieces. 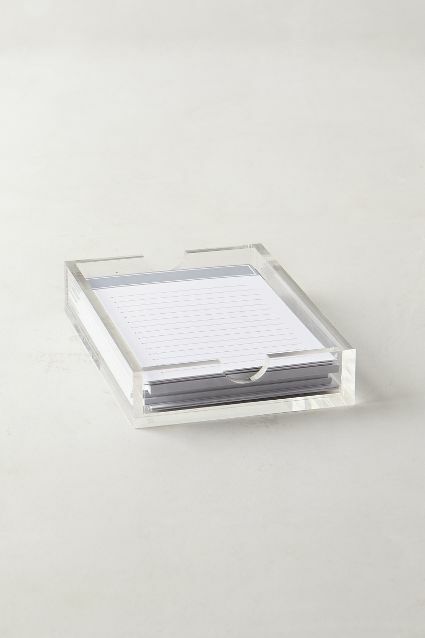 This clear, acrylic post-it note holder is perfect for a “to-do” or a “positive vibe,” I have one post-it that reads “Your potential self is Infinite” and I like to keep my positive notes, images, and collage of what I like NOW on constant rotation on my cork board. I think they sell this at Target - sorry I just found images. My site is really showing inspirational items - I know a ton of them are super expensive, but they inspire me to find cheaper iterations which you most definitely can find. NOTE CARDS. Whether you want to thank a co-worker for doing a good job or send a note to a client in the mail. These are a must. Because you can write yourself a cool quote or something you need not forget or even draw a concept. It's useful and decorative. Plus, you can always erase and re-apply. 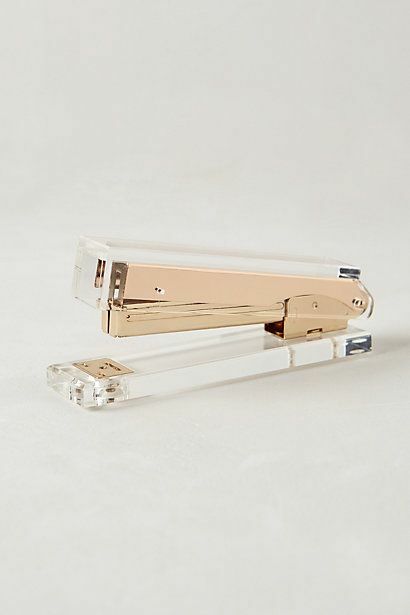 Let's be honest, a stapler is a staple (HA).. So find one that makes you happy, forget Staples plain black non-sense, find something you love. Cool tape dispensers are a staple. I'm not sure why we have tape on our desks because tbh it's not used that often but if it's going to be there, make it a cool one. These metallic journals make me happy. I always use tabs on mine to separate the different projects I am working on. You could also separate by client. Whatever suits your business.